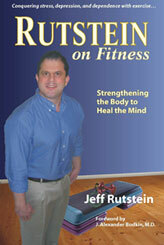 Whether you are looking for an exercise program to get you in shape or are battling depression or other emotional problems, Rutstein on Fitness: Strengthening the Body to Heal the Mind, is the book for you. Author and fitness expert Jeff Rutstein is passionate about taking the no pain, no gain attitude out of working out — and with good reason. The gentler, kinder fitness program described in Rutstein on Fitness, changed his life — and it is a book that can change yours. Men and women of all ages progress comfortably, step by step, through easy, relaxing exercises with wholesome benefits. "His is a powerful story that could touch readers. The real power in this book comes from the author's emotive writing style that allows him to connect with readers. Rutstein isn't talking "at" you, as so many fitness authors do, nor trying to motivate you in an insincere "rah, rah" manner that characterizes other similar titles. He is rather appealing to the side of you that wants to take care of mind and body." "As doctors discover how emotions can help heal the body, fitness specialist Jeff Rutstein…shares his road to recovery with others." "[This program] gets people to focus on their specific muscle group instead of on their negative thoughts." "Jeff's book will help guide you to a new life." "Jeff Rutstein's personal story of using exercise to break the cycle of addiction is very inspiring, and he shares his hard-won wisdom in this clear, easy-to-follow book. His emphasis on "mindful movement" to reduce stress and feel better is a refreshing and welcome change from many exercise books that focus solely on appearance." "If you suffer from depression or related problems, you need to know what is in this book."